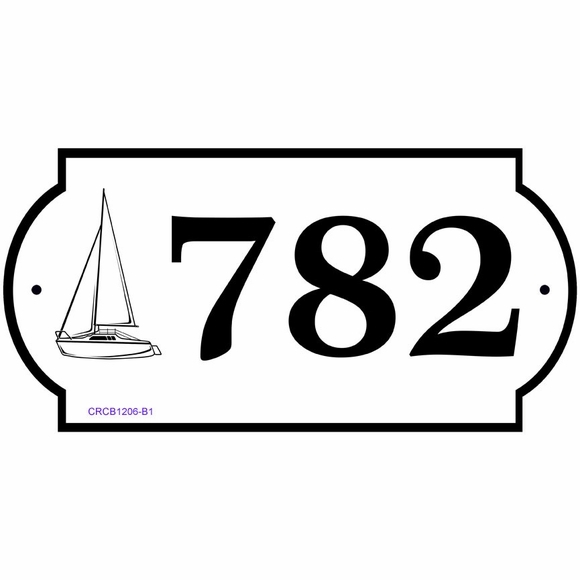 Personalized Nautical Address Plaque - - one line address sign features a nautical logo on the left and your house number on the right. Made in USA. 12" x 6" wall mount sign custom made with your address number, nautical image choice, and color selection. Decorative enhanced rectangle shape. Twelve nautical theme logos: sailboat, fisherman, open cuddy, twin outboard, outdrive, anchor, wooden wheel, rowing team, life ring, canoe, lighthouse, and cabin cruiser. Note: the style number you see on the sample sign is for internal use only and is not shown on your custom sign. Characters, logo, and border are permanently engraved into the sign during the production process. Custom made to 2 to 3 weeks for delivery. Personalized nautical theme address number sign made in the USA by skilled artisans to assure the highest quality.